Lembeh Strait Indonesia, May 2014 ~ What if you carried your home around with you – one that you built yourself – what shape would it be? If you were a worm, then I guess a tube would make sense. I watched the tiny, one-and-a-half-inch, onuphid worm in its clear tube, struggling to negotiate the clumps of algae that covered the black sand slope: stretch forward and grab something, pause, yank the tube forward, feel around, reach sideways and grab something, pause, yank the tube sideways – whew – it seemed like a lot of work! 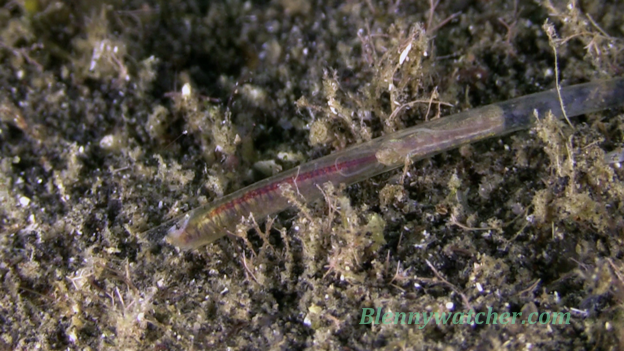 The worm wasn’t anything new – we see them on many of our dives in Lembeh – but I was killing time, waiting for Ned and our guide, Man, to move up the slope, so I watched. Polychaete worms in the genus Hyalinoecia (from hyaline, meaning transparent, glassy) inhabit clear tubes that they build by secreting a material, onuphic acid, the chemical composition of which has been of much interest to scientists. 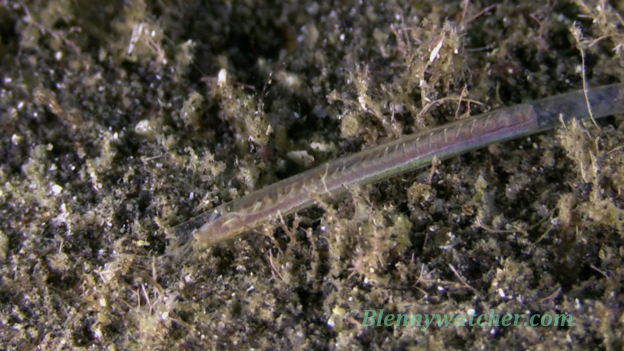 Other genera in the family Onuphidae build tubes, but they cement things to them like shells and sand and in many species the worms remain in one spot, tubes partially or totally buried in the sediment. But my worm was mobile, carrying its house with it and through the miracle of the macro extension on my camera port, I could see its entire iridescent body undulating and pulsing down the length of the clear tube. The turning worm: doubled over in its tube. Then it turned! The worm doubled over on itself – basically doing a back flip inside its tube – and exited out the other end to struggle off in the opposite direction. Whoa! Worm watching just got interesting – now I have questions. For starters, this suddenly doesn’t seem like a very good house design – open at both ends – like a soda straw. How would the worm, preoccupied with dragging itself around and foraging for food, protect itself from a rear attack? Is it even in danger of a rear attack – what, if anything, eats these worms? 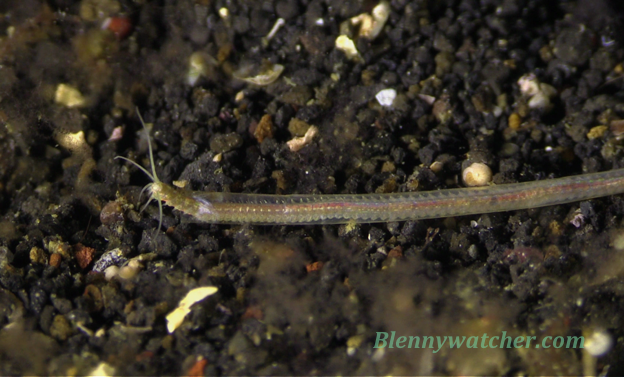 It turns out that these worms build 2 – 3 pairs of membranous valves at each end of the tube. 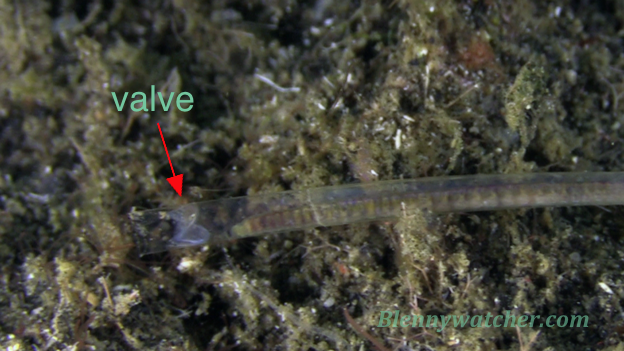 The valves open when the worm pushes out and close by the force of incoming water when the worm retracts. So the worm can operate out of whichever end is convenient and its rear is sealed and protected. As it grows, the worm lengthens its tube and the valves are removed and rebuilt closer to the entrance. And these valves are not constructed in a haphazard manner: the membranes making up a valve at the front end of the tube are placed opposite from each other; at the narrower, back end of the tube, they are offset. The placement of the valves in this very regular pattern is evident by the traces of the old membranes on the sides of the tube. On the front end, the pattern is “v” shaped and on the rear end, the pattern is zig-zagged. In looking around for information about what preys on the worms, I found a mention of one in an aquarium that was eaten by another species of worm and another account of a dissected starfish that was chock full of the undigested tubes – really, the photo is pretty amazing – Echinoblog included the image in the post, When Starfish Eat Too Much! !